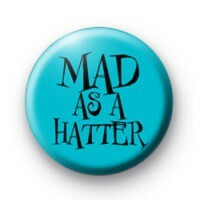 Taking inspiration from one of our favourite films - Alice in Wonderland this blue and black button badge has the slogan 'Mad as a Hatter' written in a fun font. We all know someone that is a little wacky and bonkers just like the Mad Hatter & this would make a fun badge for them to wear. We have a nice selection of Alice in Wonderland inspired badges so make sure you check them out too.